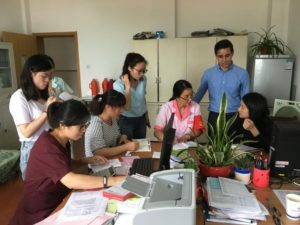 Pedro Gallardo works to reduce diabetes hospital admissions in China (Courtesy of Pedro Gallardo). From the United Nations General Assembly in New York to the Center for Disease Control in Zhejiang, China, Stanford students are leaving their mark on the world through Stanford in Government (SIG) internships. Founded in 1963, the student-run and non-partisan SIG initiative, which is affiliated with the Haas Center for Public Policy, seeks to promote political discourse on campus. SIG offers fellowships and stipends, empowering recipients to do unpaid-yet-important work away from the Farm. The SIG fellowship places students in positions at Stanford partner organizations and provides monetary compensation. The program also provides stipends, which allow students to pursue their own internship positions that would otherwise be cost-prohibitive. Jacob Wolf ’19 used a SIG fellowship to chase his interest in education to the California Department of Education (CDE), where he is a member of the department’s accountability and reporting office. Wolf analyzes and interprets evaluation metrics, such as standardized testing, hoping to gain insight in the nature of academic performance and reduce inequality in the school system. The Every Student Succeeds Act holds individual schools accountable by moving standardized testing power from federal to state level, according to Wolf. Accountability extends beyond education, especially in diplomatic affairs. Political science major Matthew Wigler ’19 is spending his summer holding public officials accountable for foreign affairs at the political division of the United States Mission to the United Nations in New York, where he represents American interests as an intern for the U.S. delegation. Wigler said working at the U.N. taught him how to help create the more prosperous world that he envisions. Specializing in global issues at the UN Security Council, Wigler has collaborated ideas to resolve the crisis in Yemen as well as the issue of North Korea and Iran. On a day-to-day basis, Wigler can be found working on UN resolutions, negotiating with other countries and putting together diplomatic cables bound for the White House and State Department headquarters in Foggy Bottom. To fund his mission, Wigler turned to a SIG stipend. SIG stipends and fellowships also take recipients overseas. As a fellowship recipient at the United Nations High Commissioner for Refugees (UNHCR) in Geneva, Switzerland, Anjali Katta ’19 combines her lifelong experience in volunteering with her studies in engineering physics. Katta said a lot of intervention programs work without re-evaluating and updating, which leave some services outdated. 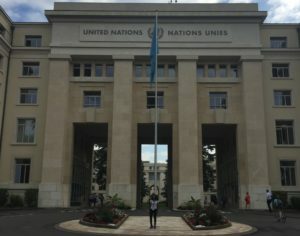 Anjali Katta spends her summer assisting the United Nations High Commissioner for Refugees in Switzerland (Courtesy of Anjali Katta). Katta hopes to bring her desperately-needed science and engineering experience to the organization. There are only three engineers working on energy within the UNHCR for more than 65 million refugees. Most UNHCR workers are legal scholars so Katta hopes her technical expertise can help the UNHCR provide electrical power to refugees. Being predictive also helps in the world of medicine, as human biology and east Asian studies double major Pedro Gallardo ’19 proves through his fellowship at the Provincial Center for Disease Control and Prevention Center (CDC) in Zhejiang, China, where he studies avoidable hospital diabetes admissions. His work aims to see what percent of hospitalizations could have been avoided if patients were treated during primary care. At the CDC, Gallardo assists in editing and writing research papers in English to submit them to international public health journals. As the first foreign intern at the center, Gallardo hopes to inspire international collaboration. Not too far from Gallardo, Alexis Kallen ’18 is working at the Justice Centre Hong Kong, a nonprofit law firm that advocates for refugee rights. Kallen contributes to research and advocacy, seeking to create a proposal on refugee policy to be submitted to Hong Kong government at the end of the summer. There, Kallen compares Hong Kong laws to countries with similar laws such as the UK and Australia. She will use these comparisons to make recommendations for improving Hong Kong’s refugee laws. “I would stress the absolute importance for everyone at Stanford to at least have one solid public service experience because I don’t think you can go into the world –whether that be the legal world, the medical world, any of that–without learning what it looks like to serve other people,” Kallen said.